How is the Testmasters PE Chemical Exam Course Set Up? Review Course: Theoretical concepts are explained to refresh and give students an understanding of important PE Chemical Exam topics. Many example problems are worked out in class to reinforce these concepts. The focus of the Testmasters PE Chemical review course is to review the important concepts needed for the exam and begin the development of the student’s problem-solving proficiency. 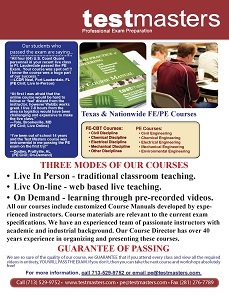 The PE Chemical Exam Test Course is a 51-hour classroom course divided into two parts. Part 1: a 30-hour course taught with the Mechanical Engineering course. The topics covered in Part I are Economic Analysis, Fluids, Pumps, Heat Transfer and Exchangers, Thermodynamics, Power Plants, and Combustion. Part 2: a 21-hour course of the following Chemical Engineering subjects: Mass and Energy Balance, Mass Transfer, Chemical Thermodynamics, Plant Design and Kinetics. Each part is independent of the other. What is the format of the PE Chemical Exam Review? This 36-hour review course partially prepares students taking the PE (Chemical) exam. Students will take selected topics (Economic Analysis, Fluids, Pumps, Heat Transfer/Exchangers, Thermodynamics, Power Plants, and Combustion) from the review course and workshops offered for Mechanical Engineering. This will help to prepare but not provide a complete preparation for the exam. In addition, a Practice PE Exam booklet and notes will be provided for some of the following topics: Mass and Energy Balance, Mass Transfer, Chemical Thermodynamics, and Kinetics.